It’s been a whirlwind week here at Eureka Crystal Beads. After creating Facebook and Twitter profiles, a blog seemed like the next logical step. With these few keystrokes, we are now firmly established on the world wide web. 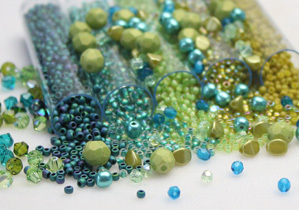 It is in this blog that we will explore all of the up-to-the minute trends, latest innovations and creations in the world of beading, with special emphasis on Swarovski Crystal elements and Czech glass beads. We want to introduce you to the newest products, techniques, methods and designers. But first, let us introduce ourselves. Since its founding in 2004, Eureka Crystal Beads has worked hard to provide customers with the best quality crystal and glass beads and exceptional customer service. We began with one small table at a Bead Expo in Fitchburg, MA with about 50 items. Today we carry over 4000 items in our webstore and do over 30 shows a year in New England and the Mid-Atlantic region. We are now in the midst of a major expansion. It is a very exciting time as we will be introducing new product lines, appearing at more shows throughout the country and partnering with Swarovski designers. We owe all of our successes to our loyal customers, many who have been with us from the very beginning and deserve our most heartfelt thanks.